Dental veneers are made out of dental porcelain, which is a material that reflects light much the same as your natural teeth. But unlike the teeth you were born with, veneers are not porous — meaning they will not absorb stains from coffee, tea, soda, ripe berries, tomato sauce… the list goes on. Dental porcelain can be customized to match the shade that will suit your smile best, and that’s usually about the shade of the whites of your eyes. 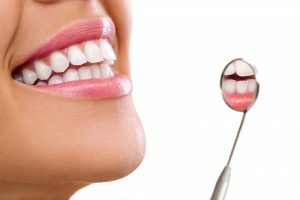 You may need to visit your dentist for a polish every now and then, but once they have been placed on your teeth, you can pretty much expect the veneers to stay that same color for their lifetime. With proper care and maintenance, your dental veneers can last for up to 20 years. Your teeth change over time, and eventually the veneers will need to be replaced to keep up with your gum line and the wear and tear that naturally occurs. Veneer replacement is as simple as the initial procedure. Taking care of your veneers as recommended will help to ensure that you enjoy your beautiful smile for as long as possible. Keep these tips in mind to keep your veneers strong and intact for the long haul. Continue to maintain excellent oral hygiene habits, including brushing and flossing and visiting your dentist as recommended. While dental porcelain cannot develop tooth decay, the teeth and gums are still vulnerable. Gum recession caused by gum disease can result in a space between the gum line and the veneer. Protect your veneers with a mouthguard if you play contact sports or grind your teeth at night. Placing repeated pressure on the veneers can cause them to chip or break. Avoid biting directly into hard or crunchy foods, which may result in loose or broken veneers. If you notice a problem with a veneer, don’t hesitate to get in touch with us right away. Now that you know a little more about one of the most popular cosmetic dentistry procedures, what are you waiting for? We invite you to learn more about porcelain veneers in Lacey — most adults are excellent candidates for the procedure! Dr. Peterson and Dr. Cammack are cosmetic dentists the Lacey area trusts with its smiles. They offer patients of all ages a comprehensive list of services from general and restorative dentistry to beautiful cosmetic treatments. Please do not hesitate to contact us at 360-459-4420.